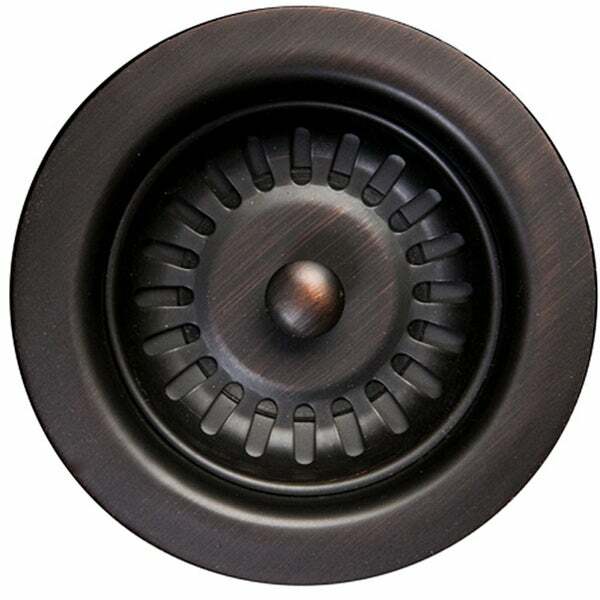 Keep your drain unclogged with this Premier Copper Products basket strainer drain. The brass and PVC construction ensures sturdiness, while the oil-rubbed bronze finish gives your sink a polished, high-end look. I like this sink strainer drain a lot. The color was perfect and matches my oil rubbed faucet pefectly. I really like how the strainer locks into the drain - it sits flat in the drain, then it locks down when you want to plug the water. So much better than the old strainers I'm used to that don't lay flat and food gets stuck on the side between the strainer and the drain so that you have to dig it out by hand. Gross! No, this one is perfect! I noticed another reviewer complained that the bottom is plastic. It is PVC. With all the PVC piping these days, I didn't think anything of it. It lined up perfectly with our PVC drain pipe. I also noticed another reviewer commented the metal is too thin. It is a bit thin, I suppose. But once you use plumber's putty to seal it to the bottom of your sink, I really don't think the thickness of metal rim is ever going to be an issue. It's certainly not noticeable once installed. And it's certainly not so thin that you'd have to worry it is going to break. And c'mon, for this price, you can't expect it's going to be top of the line. It's a great product if you ask me. And the price was even better. I'd definitely recommend this product! We remodeled our kitchen 3 years ago and installed all ****** faucets and strainer baskets in oiled rubbed bronze. The strainer drain baskets ran around$$$$ each. Within 6 months the bronze was completely gone off the baskets and they pure brass was the color. One of the strainer baskes where you put in the basket had the drain area break and we could not hold water in the sink. There was no place for the actual basket to set into it. Very upset considering such a high cost. There is no oil rubbed bronze strainer basket on the market that I could find that had a decent review. Not even one, not at any price. This particular item had the best of the reviews and the price was half of what others are asking. So if they last as long as the high end ***** ones, then they are worth the money. I figure I could replace them twice for the cost of replacing one time with *******. I have a new house the drain strainers in the new sink were terrible. They wouldn't seal and had crevasses that were difficult to keep clean. This strainer is so well made and seals the sink perfectly. I love it! When I received my sink drainer I could not believe it. It looked better than i even imagined. It fit my sink to a tee. I love it and I will give this product 5 stars plus an extra one. Perfect for my oil rubbed bronze faucet. Completed the look perfectly. This drain matches our oil rubbed bronze faucet and looks great with the hammered copper sink. A little thing like this can make all the difference in your bar/sink area. Looks so good in my new granite sink and the new faucet matches perfectly. Love to shop at O. Price was great too. This drain was recommended to go with a copper sink and it looks great with it. I shopped with a very sharp pencil when i was totally rebuilding my finished basement after it was destroyed by ground water following Hurricane Irene. I needed a bronze strainer drain for my new coffee-bean brown bar sink and i found products similar to this one at prices ranging up to three time the Overstock price. this was a great buy and i am very satisfied with the performance of the strainer. It was delivered promptly and was well packed. We purchased the Premier Copper Apron sink at the same time we purchased this drain. The sink does not come with a drain and we wanted one to match when we add the garbage disposal below it. The colors go perfect together! I look forward to seeing everything in place after our kitchen remodel is completed! Beautiful drain but didn’t think about it possibly containing lead until package arrived with warning label. I am so glad I ordered these to match my copper sink. Very good quality and it all worked perfectly on the install. I am in a small town and finding a selection of unique products is sometimes hard. Beautiful Drain but I could not use it with my sink. Fit perfect and matched the faucet perfectly. Quick and easy install. Perfect match for my faucet. Gives my Sink a nostalgic feel. "Will this drain work with a fireclay farmhouse sink?" Our D-132ORB drain is a standard 3.5” kitchen sink drain size so if the Fireclay sink has a 3.5” drain opening then it should fit just fine. "How long is the neck? I have an American Standard Country Kitchen Sink. Does this drain fit thick stone sink?" This item is designed for a drain size of approximately 3.5 inches with an outer dimension of 4.25 inches. The neck measures approximately 2.5 inches. "Does this product have a warranty? FInish has started to come off." Hello kathydoze, this item features a Limited Lifetime Warranty. Thank you for shopping with us. Needed it to match sink. Hard color to find. Very pleased. "My sink is a Kohler Cape Dory with a drain hole of 3 5/8". Will this strainer fit this sink?" Thank you for contacting us, klwjrw. Yes, this drain should work perfectly for your Kohler sink with no problems. This drain is made to U.S.A. plumbing standards and fits almost any well recognized brand of kitchen sinks. Please let us know if you have any further questions. "Is this the drain sleeve and the strainer or just the strainer?" Thank you for contacting us rmhill81. This product comes with the drain sleeve and the strainer cap. Please let me know if you have any other questions. "What part of this strainer basket is made of PVC?" Thank you for contacting us dairefrank. The bottom portion of the drain that connects to the plumbing outlet is made out of pvc. This is standard with almost all Kitchen Strainer Drains. The top flange and basket are made out of brass. Please let us know if you have any further questions.